It’s been an amazing week so Wanderlust Wednesday was pushed to Saturday. Oops! This week’s spotlight is on my current city of Atlanta. I have lived here for 10 years and while I don’t claim to know everything about Atlanta, I have learned a few things. I’m a little enchanted by the city right now since Outkast #ATLast is this weekend and everything Atlanta is magnified. I respect those that have grown up here and love this city to its core. Between the food, the people and the overall vibe, Atlanta is an easy city to love. I composed a small list of things most Atlantans experience. This is by no means ALL we do, just some of the things that are inevitable. It is an absolute necessity to have at least 2 alternate routes to go anywhere. People think Atlanta is kidding when we talk about traffic. You can easily be in a bumper to bumper jam at 11:00 pm and there is no wreck or construction in sight. The traffic here will have you contemplating your life decisions and trying not to go insane. Rush hour is from 7am – 8pm so going anywhere requires a traffic forethought. Piedmont Park, Chastain Park, Wolfcreek, Lakewood, Verizon…we have enough amphitheaters, venues and concerts to please any and every music lover. Music Midtown takes over Piedmont Park, the Chastain Park Concert Series lasts all summer, and the Old School Concert Series at Wolfcreek hosts 4 concerts for $25 each. Grab your chair, a blanket and some food (some places let you bring your own) and enjoy the warm weather and your favorite musicians. The best part is artists always make Atlanta a stop on their tour so even if you aren’t outside, you will be happy. Speaking of Piedmont Park, EVERYONE goes to Piedmont at the first sign of decent weather. Kids, couples, kickball aficionados, first dates, shirtless runners, and every dog within 20 miles head to Piedmont Park in an effort to just enjoy being outside. The park has a lake, a dog park and enough green space that affords all that venture out to have a little room to themselves. There are apparently at least 71 streets in Atlanta with Peachtree in the name. It can be confusing as hell especially when trying to give someone directions and they keep saying “I’m on Peachtree” and you keep asking “which Peachtree?” After asking your friend what buildings or restaurants they see, you are able to decipher the Peachtree code and realize they are on Peachtree Rd. Whew! 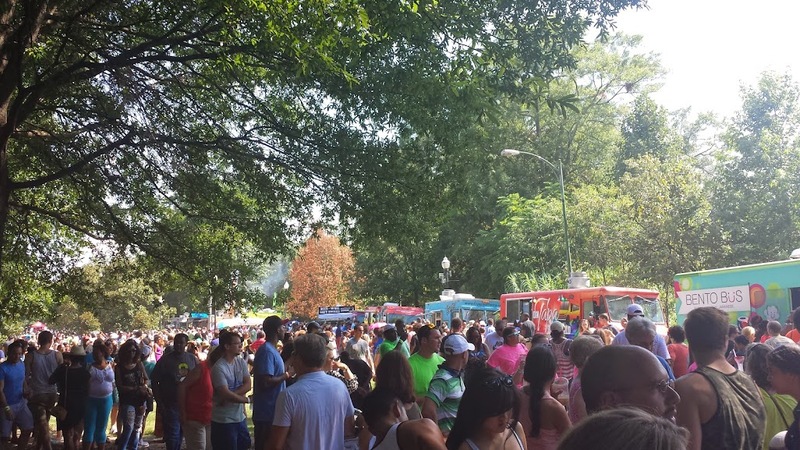 One of the greatest things about living in Atlanta is its festivals. There are over 75 festivals in Atlanta each year and there is something special about each one. The food is great and the culture is vibrant. Every park has their own celebration and the local artists, designers, photographers, craftsmen and any other creative soul has a home in the Atlanta festival scene. Notable festivals: Inman Park Festival in April, Jazz Fest in May, Beer Fest in June, Decatur BBQ in August and Greek Fest in October. All cities have at least one claim to fame. Atlanta claims the world’s busiest airport, hip hop capital of the south and the strip clubs. Some like Magic City, some head to Cheetah and others want a “unique” experience and go to the Clermont Lounge, but men and women alike flock to the strip clubs of Atlanta. *BONUS* If you have ever been on a night that someone has decided to “make it rain,” you watch the whole place transform into a big party. 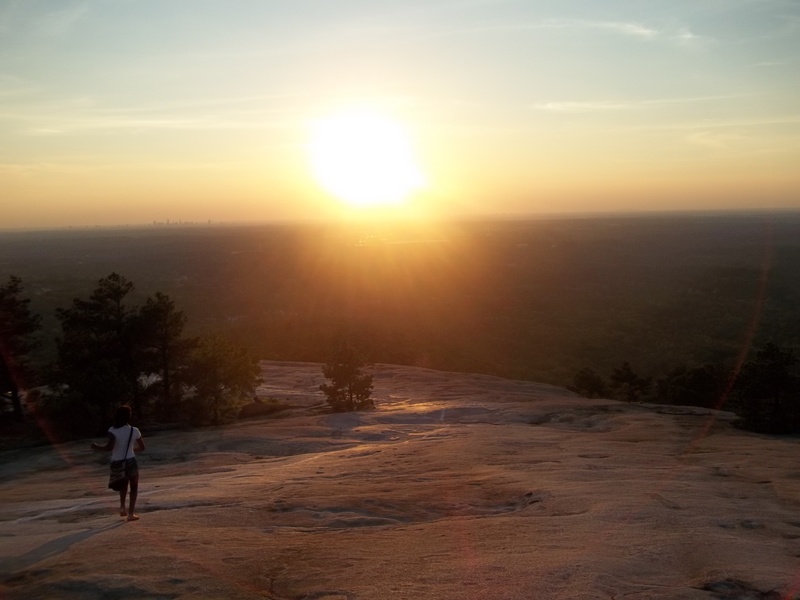 In an effort to be more fit, locals will venture to hike up Stone Mountain or Kennesaw Mountain. Each trail is 1.3 miles and provides a great cardio workout. The reward at the end of each is a beautiful view overlooking the Atlanta skyline. Once you stop staring at the view it’s time to hike back down. Going out to eat is a serious social outing. Restaurants are owned by chefs and groups who will put a spin on pretty much anything and create an atmosphere with a sophisticated vibe. People may come to Atlanta to see the sights and all, but they will be wowed by the food and the ambiance. There is a cuisine for all palates and eateries that will make you gladly abandon your comfort zone for something you see at the next table. Brunch is so serious here that Saturday and Sunday brunch is common. The most popular places don’t even take brunch reservations but are definitely worth the wait. Hungry? “Oh look! That’s Denzel Washington.” Atlanta has been dubbed the “Hollywood of the South” since so many movies and T.V. shows are filmed here. The city is also home to several Grammy Award winning artists. It’s pretty common to see celebrities playing with their kids in the park, eating at the table next to you or even shopping in the same store. The great thing about most Atlantans, is we don’t care. A-List celebrities are able to eat and live in peace. Occasionally someone will ask for an autograph but overall, we will leave people alone. It’s a weird conversation but if you live here long enough, you will inevitably get into some discussion about living Inside the Perimeter (ITP) or Outside the Perimeter (OTP). The Perimeter is the I-285 loop around the city. I have stayed in both and still don’t really care. It’s important to know what is going on in the city. If you know what’s going on, you know where NOT to be. Atlanta is famous for scheduling huge events all on the same weekend. Events = traffic and crowds. People coming in for DragonCon, cheerleading competitions, award shows, football classics, conventions and any other special events are going to be in one main area, downtown and midtown. Therefore, anything that has to be done in those areas will have to wait. It’s easy to lose track of time with great friends in a chill environment. With drinks flowing and food on order, a lazy afternoon/ evening is the perfect way to catch up and also meet new people. The Glenn Hotel has one of the best views of downtown Atlanta (personal favorite) but some other greats are Park Tavern, Six Feet Under, Tin Lizzy’s, Two Urban Licks and Shout. Posted in North America, Storytellers, Wanderlust WednesdaysTagged Atlanta, Brunch, Clubs, Concerts, Festivals, Food, Georgia, Hollywood of South, Midtown, Parks, Shout, The Glenn, TrafficBookmark the permalink.